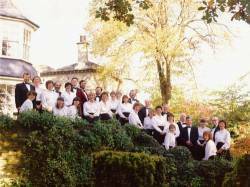 The Sinfonia Chorale, previously known as the English Sinfonia Chorale, is a small four-part choir in the East Midlands. It has around forty members, including professional musicians and amateur instrumentalists. All have many years of experience of singing in choirs and small groups. Sometimes the choir sings with an orchestra or with organ or piano accompaniment, but a cappella (unaccompanied) singing is central to the repertoire. 2016 marks our 50th anniversary. The Chorale was born in 1966 when ATV invited the orchestra (at that time known as the Midland Sinfonia) to give a Christmas concert and asked the conductor, Neville Dilkes, to recruit singers for the purpose. He in turn asked a local musician, Catherine (‘Kate’) Baxter, to assemble a group of vocalists. Kate, a well-respected conductor of the Fenland Singers, recruited some from this choir but the majority from the University of Nottingham’s Music Department. An informal musical gathering with Neville Dilkes and Kate was held in October 1966 and a chorale formed with the same name as the orchestra, to sing at the Christmas concert with accompaniment by Christine Simmonds. This group initially numbered about twenty singers, most of whom were musicians in their own right. The orchestra were thus able to have their own choir and perform works such as Borodin’s Polovtsian Dances and concert versions of Gilbert and Sullivan operas. In 1968 there were four ‘Gold Leaf’ concerts for choir and orchestra, involving well-known broadcasters such as Wilfred Pickles and Owen Brannigan. After this the name of the orchestra (and choir) was changed to the English Sinfonia. The first concert under the new name was in London at the Wigmore Hall and included Purcell’s Welcome to all the Pleasures. The Chorale was augmented in 1970 for a performance of Bach’s Mass in B Minor, after which the ‘extras’ were invited to audition if they wished to continue. The audition was taken by Neville Dilkes and involved sight-reading and singing and the answering of obscure questions about tessitura (range of voice). The outcome of the auditions resulted in a group of around thirty. Two of our present number joined at this point. The English Sinfonia Chorale continued to sing only with the orchestra for several years, meeting for ad hoc rehearsals a few weeks before each concert. Performances took place in the Albert Hall – at that time the main concert venue in Nottingham – of such pieces as concert versions of West Side Story and The Mikado, and were introduced by celebrity broadcasters of the day, such as Steve Race, Johnny Morris, David Kossoff, and Richard Baker. The choir were also invited to sing carol services at the church in the village of Tixover where Neville Dilkes lived. This was a very chilly venue but we were warmed up afterwards by hot mince pies and much wine at his home. On one occasion we were encouraged by the wine to stand around the piano and sing a version of The Twelve Days of Christmas, the pianist, Christine Simmonds, playing a complicated accompaniment without music and modulating up a semitone after each verse. After singing with the orchestra for several years, the choir decided to give additional concerts of a cappella music and songs with piano or organ accompaniment, and to have regular weekly rehearsals. During this period there were several appearances on radio and local television. We took part in a live broadcast on Radio 4 of the Watchnight service from St Mary’s, Clifton village; and sang in June 1978 at the reopening of the Theatre Royal, Nottingham in the presence of HRH Princess Anne. 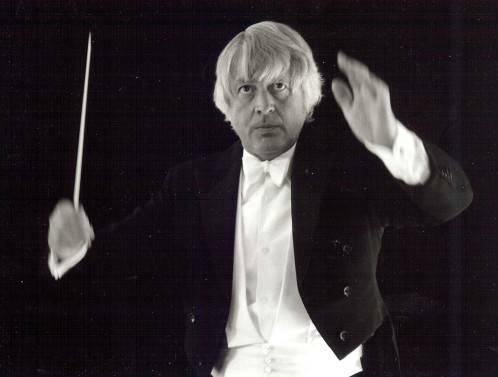 Neville Dilkes continued to conduct us whenever we sang with the orchestra, and from 1972 to 1973 Colin Mair took our weekly rehearsals and a cappella or piano-accompanied concerts. In 1973 Andrew Burnham was appointed as chorus master of the 30-strong choir, having been invited to audition for this position by a choir member, Alan Burgess. It was Andrew who introduced the choir to the delights of unaccompanied polyphonic early music, both sacred and secular, using the Sanctus from Victoria’s Requiem as his audition piece. Byrd’s Mass for Four Voices formed part of our first concert with him. Andrew was an inspiring conductor and drew forth exciting performances from the choir. One of his particular strengths was an amazing ability to bring from us a good performance at the concert, even if there had been less time to rehearse than some members would have preferred. His spur-of-the-moment talent was also shown when we took part, as we occasionally did, in a church service: he was apt very quickly to write a descant to a hymn and pass it to the sopranos just before the final verse! Stephen Fairlie also took part during this period as deputy director. Andrew resigned in 1990 to become a full-time minister in the Church of England and, after a brief ‘inter-regnum’ by Philip Olleson, was succeeded by our present director, Richard Roddis. 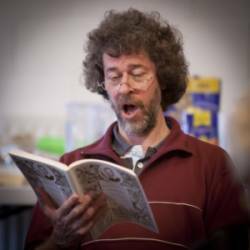 Richard is well-known throughout the East Midlands for his work with choirs. 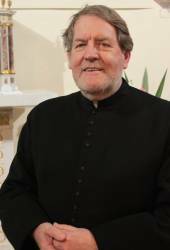 His conducting experience stretches back more than thirty years, so he brings much experience to choral conducting. One of the many advantages of being directed by Richard is that he is himself a professional singer of repute, and so is able to guide us, not just in accuracy of performance and sensitivity of interpretation, but also in the actual techniques of singing. Under his leadership the choir took part in a performance of Handel’s Messiah, recorded by Classic FM; and in 2002 won the adult Choir of the Day at the Sainsbury’s Choir of the Year auditions. Management of the choir has changed considerably over the years. Once the choir began to sing apart from the orchestra, a committee was appointed which met to discuss choice of music, auditions, venues for concerts, and so on. However, this was on a fairly casual basis and no minutes were kept. In 1993 a more formal procedure was initiated with regular meeting of the planning committee. Minutes were taken and circulated together with annual reports on the financial state of the choir. In 1974 the subscription to the choir was £1.00 annually for the thirty members, the rehearsal room at the Albert Hall costing £23.00 a year. Andrew Burnham’s annual retainer was £5.00. (The value of money has of course changed considerably, but that still seems a very modest amount.) At this time the fee for performance in a local church (Castle Gate Congregational Church, Beeston Parish Church, Worksop Priory, Clifton St Mary’s) would be £10.00, with £20.00 for St Mary’s Nottingham and £80.00 for Southwell Minster. In recent years the financial management has become increasingly complicated compared with earlier days, and the posts of secretary and librarian are equally demanding and time-consuming. One major difference at the present time is that getting hold of copies of music whilst not exactly easy is at least more possible than it used to be. In the early days it was prohibitively difficult - too expensive to buy and too complicated to borrow. We are grateful for the work of our treasurers and auditors, secretaries and librarians, without whom we could not continue to flourish. The choir ‘uniform’, too, has changed over time. In the late 1960s the men wore dinner jackets with dark green Nottingham lace cummerbunds, and the women white blouses and black skirts with jabots made of the same green lace. These days the uniform is simpler: black, with the addition of coloured scarves for the women. Another thing that has changed is the choir’s name. Once established as an independent body the choir felt it inappropriate to retain the orchestra’s name, and in 1985 the ‘New English Chorale’ was chosen. Unfortunately, there turned out to be another choir with a very similar name, so in 1991 the choir became the ‘Sinfonia Chorale’. The choir was granted charitable status in 1995. 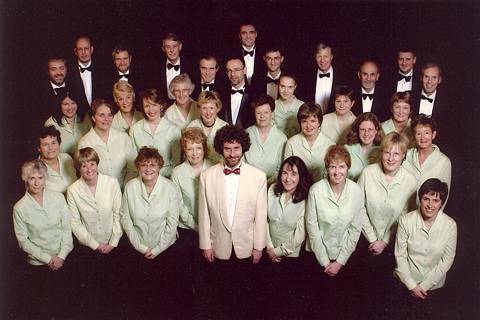 After its beginning as an entity separate from the English Sinfonia Orchestra, the choir continued to sing with them occasionally into the 1970s. At the same time the choir developed its performance of a cappella work and also of music requiring orchestral or keyboard accompaniment. We sang with the Nottingham Pro Musica Orchestra under Derek Williams in 1974 for a performance of Beethoven’s Ninth Symphony, with the Brass Consort in 1993, the Early English Music Group in 1976, and various Baroque and modern orchestras. The audiences enjoy the instrumental side of these concerts, but so do the choir. It can be awe-inspiring to watch (and hear) instrumentalists tuning and playing what are often very challenging brass and woodwind and early stringed instruments. We have been blessed by excellent accompaniment at our concerts: on the organ by John Keys, John Morehen, Michael Overbury, Nigel Day, John Davenport and Philip Robinson; and on the piano by Anthony Clare, Liz Pike, and John Sands – and Clive Pollard, sometimes for his own choral and piano arrangements. We are especially grateful to two accompanists. The first of these, Christine Simmonds, was a founder member of the choir. Particularly memorable was her sensitive playing of such pieces as Brahms' Liebeslieder Waltzes (1979); but perhaps even more so her accompanying of Rossini’s Petit Messe Solonelle (also 1979), the music of which she sight-read at a moment’s notice. Another to mention is our most recent accompanist, Charles Tebbs, who was with us from 2012 to 2016. He has been an excellent pianist and an invaluable support at rehearsals and concerts. The Sinfonia Chorale performs music written over the last five centuries. Some of the early music is composed for many parts and/or several choir groups, and is particularly exciting to sing: music such as Spem in alium, Tallis’s motet for 40 voices (performed several times), Biber’s Vespers for 32 voices (2008), and Monteverdi’s Vespers (performed in 1979 with Christopher Hogwood playing continuo and again in 2010). Baroque music appears frequently in the repertoire: Bach’s Mass in B Minor (2002), Bach’s St John Passion (2006), Handel’s Messiah (2014), Vivaldi’s Gloria (1998), and many others – these are only examples. Music written in the 19th century includes Faure’s Requiem (2004), and Brahms' Requiem with accompaniment by piano duet (2012). The choir’s name is perhaps increasingly associated with more recently composed music; for example, Finzi’s Requiem da Camera (2004), Tippett’s A Child of Our Time (2000), Britten’s War Requiem (2000), Pärt’s St John Passion, and Poulenc’s Figure Humaine (2000). In 1998 the Sinfonia Chorale sang Robert Steadman’s Gloria, commissioned by the choir. Several works by Rütti have been performed: Missa Angelorum (2001), O Magnum Mysterium (2005), and Requiem for double choir (2012). The repertoire also contains many pieces by Eric Whitacre: The Seal Lullaby, Water Night, Cloudburst, etc. Music by our Director, Richard Roddis, also takes an important place: Pieta (2005), Carolling Nowell (performed at several Christmas concerts), Lauda Creatoris, and several lovely folksongs. Yearly Christmas and occasional Summer concerts at Patchings Art Centre began in 1996 and still continue. (see picture above from 2014). At events such as the Summer and Christmas concerts the choir also performs lighter music. The Wind in the Willows, with music by Rutter, is an example of Summer music, and Leonard Bernstein’s West Side Story. The Twelve Days of Christmas and lively versions of carols and well-known Christmas songs feature at that concert, which always concludes with Have Yourself a Merry Little Christmas, arranged by Peter Gritton. When a work is undertaken that calls for a larger group of vocalists, the Sinfonia Chorale joins with another choir. We have sung with the Derby Bach Choir to perform Vaughan Williams' Sea Symphony (2007) and Carl Orff’s Carmina Burana (2005). Earlier, in 2000, we sang with the Sterndale Singers: Poulenc’s Figure Humaine and Tallis’s Spem in alium. We worked separately at these pieces, which made for challenging rehearsals when we finally got together. Spem in alium being a motet for eight groups of five voices meant that each choir on its own had only half the music. Similarly, Figure Humaine constantly changes key as the music goes from one choir to the other and back again, so that we only really experienced the key changes when we got together. Tippett’s spirituals from A Child of Our Time and Bach’s Singet dem Herrn seemed straightforward in comparison. The Chorale has sung several times with the Derwent Singers: the Monteverdi Vespers (1978), a concert for Voices and Brass (2005), and the less well-known 18th century Te Deum by Teixeira (2011). This piece involved a great deal of work for four people from the two choirs in transcribing and editing the music, and particularly from the late Tom Zadik who made the whole thing legible. Further opportunities to sing with people not in the choir occur at our Come and Sing days, held once a year since 2007, introducing whatever music is to be performed at the Spring concert. These days are very well attended and enjoyed by all who come, including our own members. The Sinfonia Chorale celebrated its 40th anniversary in 2006 with an Autumn visit to Tuscany, performing music by Byrd, Pizzetti and Palestrina in the Duomo in Florence. This was very much enjoyed by the choir, the result being that another trip was made in 2008 to Krakow in Poland, performing music by Górecki, Stanford, Panufnik, Whitacre and Vaughan Williams. (We needed some coaching in pronunciation of the Polish.) One concert took place down a salt mine. In 2010 the choir visited Sabadell and Barcelona, singing alongside the Coral Belles Arts. The programme included our usual range of music from the sixteenth century to the present day and also Catalan music, which formed part of a concert in St Barnabas Cathedral, Nottingham, on our return. 2014 marked the most recent visit, to Bergedorf in Germany, singing alongside their choir, the Bergedorfer Kammerchor, who paid a return visit to us in 2015, culminating in a shared concert in St Barnabas. ‘Technically, this is one of the best equipped chamber choirs in the region’.